Some movies do NOT need a sequel. Such is the case with Ghoulies. For me the original film worked because of its creative, slimy puppet creatures and its dark, spooky atmosphere. [See my review elsewhere on the site.] Yes, the acting was a bit over the top but this gave Ghoulies the feel of a Road Runner cartoon which served it well. Alas, I cannot give the same praise for Ghoulies 2. First of all, the plot has holes and inconsistencies all over it. Secondly, the setting of a haunted house in an amusement park should have worked well but it doesn't. Too much of it is brightly lit which diminishes the atmosphere and makes the puppet creatures look less believable than in the first film. Thirdly, the acting is simply God-awful and some of the lines of cringe-worthy dialogue only make it worse. 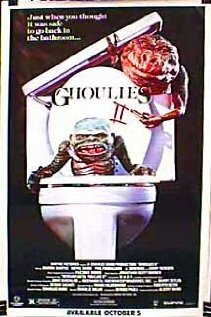 Finally, the most frightening thing about Ghoulies 2 is that it spawned another film...Ghoulies 3: Ghoulies Go To College (1991). I watched the first 10 minutes of it and it was dreadful. It's sad that the brilliance of the first film was never duplicated.